Eichner, Carolin and Berna, Fabrice 2016. 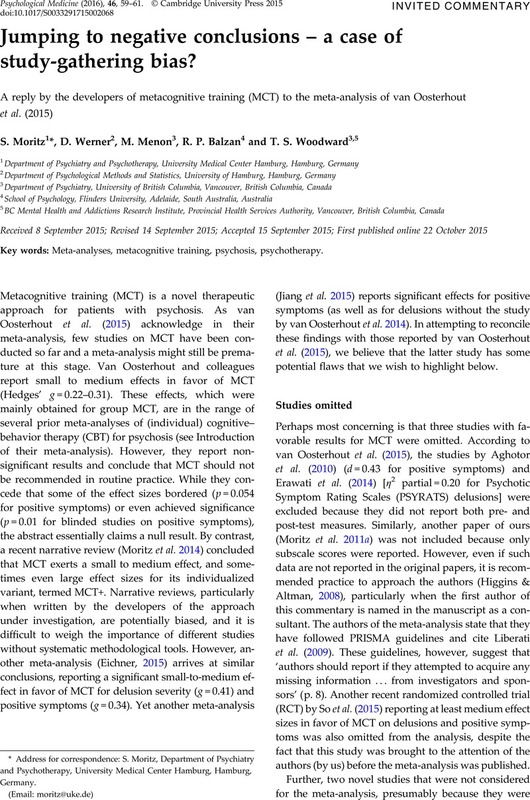 Acceptance and Efficacy of Metacognitive Training (MCT) on Positive Symptoms and Delusions in Patients With Schizophrenia: A Meta-analysis Taking Into Account Important Moderators. Schizophrenia Bulletin, Vol. 42, Issue. 4, p. 952.
van Oosterhout, B. Smit, F. Krabbendam, L. Castelein, S. Staring, A. B. P. and van der Gaag, M. 2016. Letter to the Editor: Should we focus on quality or quantity in meta-analyses?. Psychological Medicine, Vol. 46, Issue. 09, p. 2003. Aghotor, J, Pfueller, U, Moritz, S, Weisbrod, M, Roesch-Ely, D (2010). Metacognitive training for patients with schizophrenia (MCT): feasibility and preliminary evidence for its efficacy. Journal of Behavior Therapy and Experimental Psychiatry 41, 207–211. Balzan, RP, Delfabbro, PH, Galletly, CA, Woodward, TS (2014). Metacognitive training for patients with schizophrenia: preliminary evidence for a targeted, single-module programme. Australian and New Zealand Journal of Psychiatry 48, 1126–1136. Eichner, C (2015). Can Metacognitive Training (MCT) Reduce Positive Symptoms and Delusions in Patients with Schizophrenia? A Meta-Analysis Taking into Account Important Moderators. University of Hamburg, Department of Psychology: Hamburg. Erawati, E, Keliat, BA, Helena, N, Hamid, A (2014). The influence of metacognitive training on delusion severity and metacognitive ability in schizophrenia. Journal of Psychiatric and Mental Health Nursing 21, 841–847. Gawęda, Ł, Krężołek, M, Olbryś, J, Turska, A, Kokoszka, A (2015). Decreasing self-reported cognitive biases and increasing clinical insight through meta-cognitive training in patients with chronic schizophrenia. Journal of Behavior Therapy and Experimental Psychiatry 48, 98–104. Higgins, JPT, Altman, DG (2008). Assessing risk of bias in included studies. In Cochrane Handbook for Systematic Reviews of Interventions, chapter 8 (ed. Higgins, J. and Green, S.), pp. 187–241. John Wiley and Sons: Chichester, UK. Jiang, J, Zhang, L, Zhu, Z, Li, W, Li, C (2015). Metacognitive training for schizophrenia: a systematic review. Shanghai Archives of Psychiatry 27, 149–157. Lam, KCK, Ho, CPS, Wa, JC, Chan, SMY, Yam, KKN, Yeung, OSF, Wong, WCH, Balzan, RP (2015). Metacognitive training (MCT) for schizophrenia improves cognitive insight: a randomized controlled trial in a Chinese sample with schizophrenia spectrum disorders. Behaviour Research and Therapy 64, 38–42. Liberati, A, Altman, DG, Tetzlaff, J, Mulrow, C, Gøtzsche, PC, Ioannidis, JPA, Clarke, M, Devereaux, PJ, Kleijnen, J, Moher, D (2009). The PRISMA statement for reporting systematic reviews and meta-analyses of studies that evaluate health care interventions: explanation and elaboration. PLoS Medicine 6, e1000100. Moritz, S, Andreou, C, Schneider, BC, Wittekind, CE, Menon, M, Balzan, RP, Woodward, TS (2014). Sowing the seeds of doubt: a narrative review on metacognitive training in schizophrenia. Clinical Psychology Review 34, 358–366. Moritz, S, Kerstan, A, Veckenstedt, R, Randjbar, S, Vitzthum, F, Schmidt, C, Heise, M, Woodward, TS (2011 a). Further evidence for the efficacy of a metacognitive group training in schizophrenia. Behaviour Research and Therapy 49, 151–157. Moritz, S, Veckenstedt, R, Randjbar, S, Vitzthum, F, Woodward, TS (2011 b). Antipsychotic treatment beyond antipsychotics: metacognitive intervention for schizophrenia patients improves delusional symptoms. Psychological Medicine 41, 1823–1832. Reeves, BC, Deeks, JJ, Higgins, JPT, Wells, GA (2008). Including non-randomized studies. In Cochrane Handbook for Systematic Reviews of Interventions, chapter 13 (ed. Higgins, J. P. T. and Green, S.). John Wiley & Sons: Chichester, UK. Rocha, NBF, Queirós, C (2013). Metacognitive and social cognition training (MSCT) in schizophrenia: a preliminary efficacy study. Schizophrenia Research 150, 64–68. Shadish, WR (2011). Randomized controlled studies and alternative designs in outcome studies: challenges and opportunities. Research on Social Work Practice 21, 636–643. So, SH-W, Chan, AP, Chong, CS-Y, Wong, MH-M, Lo, WT-L, Chung, DW-S, Chan, SS (2015). Metacognitive training for delusions (MCTd): effectiveness on data-gathering and belief flexibility in a Chinese sample. Frontiers in Psychology 6, 730.
van Oosterhout, B, Krabbendam, L, de Boer, K, Ferwerda, J, van der Helm, M, Stant, AD, van der Gaag, M (2014). Metacognitive group training for schizophrenia spectrum patients with delusions: a randomized controlled trial. Psychological Medicine 44, 3025–3035. van Oosterhout, B, Smit, F, Krabbendam, L, Castelein, S, Staring, ABP, van der Gaag, M (2015). Metacognitive training for schizophrenia spectrum patients: a meta-analysis on outcome studies. Psychological Medicine. Published online 20 07 2015 . doi:10.1017/S0033291715001105. Wykes, T, Steel, C, Everitt, B, Tarrier, N (2008). Cognitive behavior therapy for schizophrenia: effect sizes, clinical models, and methodological rigor. Schizophrenia Bulletin 34, 523–537.